Purchase any new SuperSport model before 30th April 2019 and we will enhance your touring potential at no extra cost. The Complimentary Touring Upgrade includes Tour Pack: Colour-matched Panniers, Heated Grips & Touring Screen. Plus… Magnetic Tank Bag & Passenger Seat Bag (15 ltr capacity). Buy a new Ducati Multistrada 1260 or 1260S and claim either a free touring pack or a free apparel set. 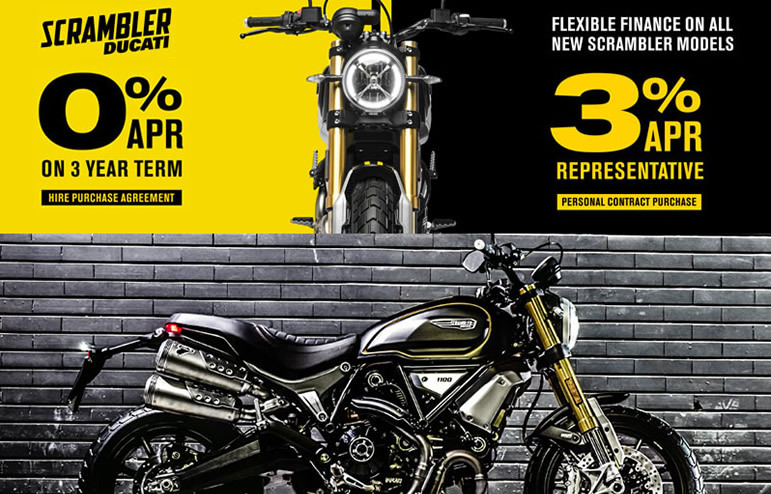 The lowest rate on all Scrambler models with 3% APR Representative PCP or 0% APR on any new Scrambler Icon, Classic, Full Throttle, Mach.2, Sixty2, Desert Sled and 1100 models.